Pesto doesn't have to be packed full of cheese for it to be good. This dairy-free version is full of flavour and a perfect match with fish like salmon. Heat oven to 200C. Place the salmon onto an oven tray lined with baking paper and lightly drizzle with a little oil. Season with salt and pepper. Bake in the oven for eight minutes or until just cooked through. To make the pesto, process the rocket, parsley, macadamia nuts, garlic, lemon juice and olive oil to a coarse paste in a blender or small food processor. Season to taste with salt and pepper. 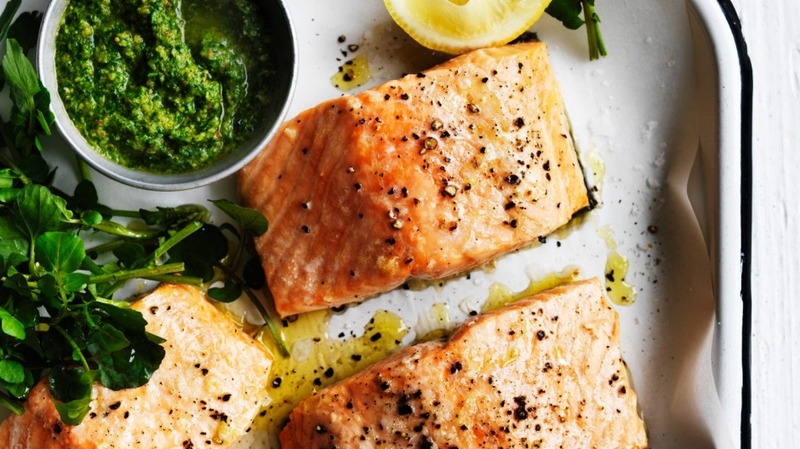 Remove salmon from the oven and spoon over pesto to serve.